Almost half a million readers submitted their favourites in Condé Nast Traveler's 2018 READERS' CHOICE AWARDS, the longest-running and most prestigious recognition of excellence in the travel industry. #1 in the Top Resorts in Africa and #5 in The Best Resorts in the World. So well-deserved and well done to this fabulous team. CNT comment — "gobsmacking, 180-views of the savanna, whether you're lying in bed or taking a shower." #5 in the Top Resorts in Africa and #11 in The Best Resorts in the World, we are incredibly proud of The Bushcamp Company for this achievement, as well as for Mfuwe Lodge being voted #14 in the Top Resorts in Africa. CNT comment — "Chindeni's strength is its simplicity. 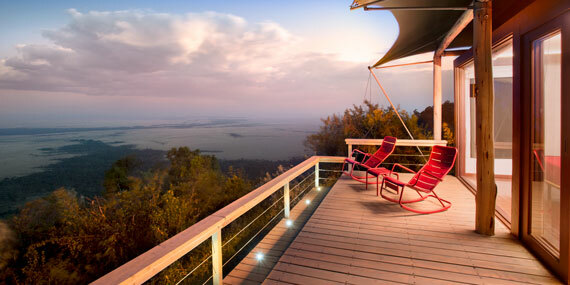 But for our buck, it's the views from the evening sundowners, taken on your terrace, overlooking the lagoon where herds of hippo wallow, that will stay with you long after you return home." Voted #6 in the Top Hotels in Africa, Gibb's Farm remains everyone's darling on the Tanzanian safari circuit. If you've visited, you'll know why. CNT comment — "This farmhouse on the wooded slopes of the Ngorongoro Crater overflows with history and character." Voted #9 in the Top Hotels in Africa, a kiss from an endangered Rothschild's giraffe is probably on most people's bucket list. Our advice? Make it happen! CNT comment — "No matter how many safaris you've been on, there is nothing quite as wonderful and unforgettable as having breakfast or tea with the giraffes here." We are incredibly fortunate to work with such a fantastic portfolio of elegant boutique hotels, ultimate safari experiences and ground-breaking conservation initiatives. Our team of 21 is based across 3 continents, sharing our passion for a sustainable Africa far and wide. If you are interested in joining our team, take a peek at our new CAREERS PAGE.